That sound when the catch just doesn’t catch, that “gurgle.” That, “Ouch,” when your neck, traps, lower back or shoulder lets you know something is tight or off in your technique. During standup paddling, as we work on technique, getting the “reach and catch” solid is a direct driver of our speed and power. While a great coach and lots of water time can provide improvement, really refining the catch is a long term commitment. In order not to get bad habits, consistent feedback is a must. When the feedback is discomfort or pain, you know you need some technique tweaking. Harry at SUP International asked Annabel, “Can you talk about signs symptoms that a paddler should look out for that would suggest they are over reaching? By over reaching I am assuming you are meaning that the entry point of the blade is too far out in front? A stroke that does not engage power as soon as the blade touches the water may be suffering from ‘over reaching’. There are many different philosophies associated with perceived ‘stroke technique’ in this sport. Due to the lack of credible and biomechanically sound information people have sought refuge in references from the internet. Great insights – very relevant for me. How about you? Take the time to read the entire interview with Annabel . You might just save yourself from an injury and the resulting “down days.” Each step of the stroke is important and needs to be practiced. Good reach and catch are important before applying the power. A reputable and experienced coach and reliable online information can help us all train smart and reach our goals. 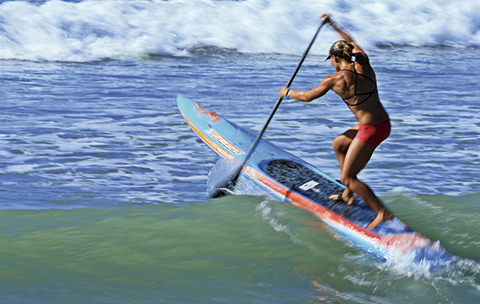 This entry was posted in SUP Fitness, SUP Racing and tagged Annabel Anderson, Ben Thouard, elder sup, SUP International, sup training, THE RED LINE by Water Words. Bookmark the permalink.